A while ago, we posted the announcement that a segment we animate and direct won an Emmy. You can view that announcement HERE. Why, it was the Emmy. And yes, they're just as heavy as everyone makes them look on TV. 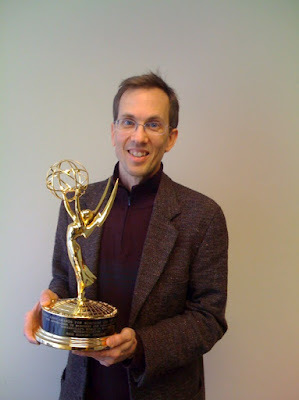 Here is our Producer--and named Director on the Emmy--David Stewart, holding up the substantial statuette. Once again--congrats to David, Brendan and the Minyanville team on the Emmy win! We're awfully proud of all of them. Hey, do you think the board would go for an AniMated Emmy at the Emmy awards next year? We think it'd be a great idea!